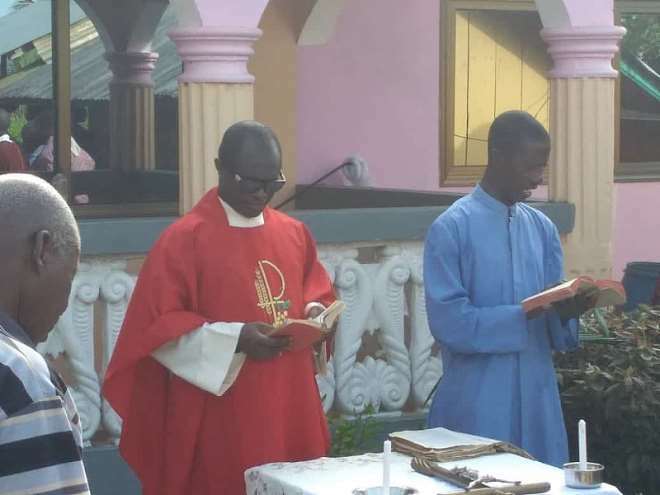 The Saint Edward Roman Catholic Church of Nuba in the Jomoro Municipality of the Western Region joined all Christians across the globe to observe Palm Sunday, April 14, 2019. 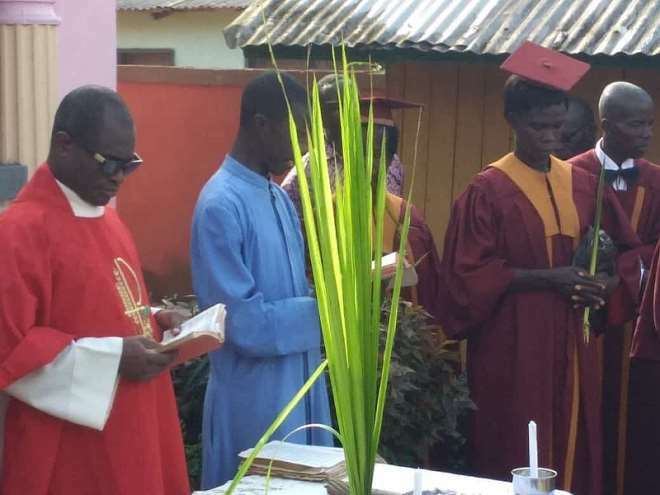 The church members took to the principal streets to of Nuba and its environs with decorated palm leaves sang 'Hosanna'. 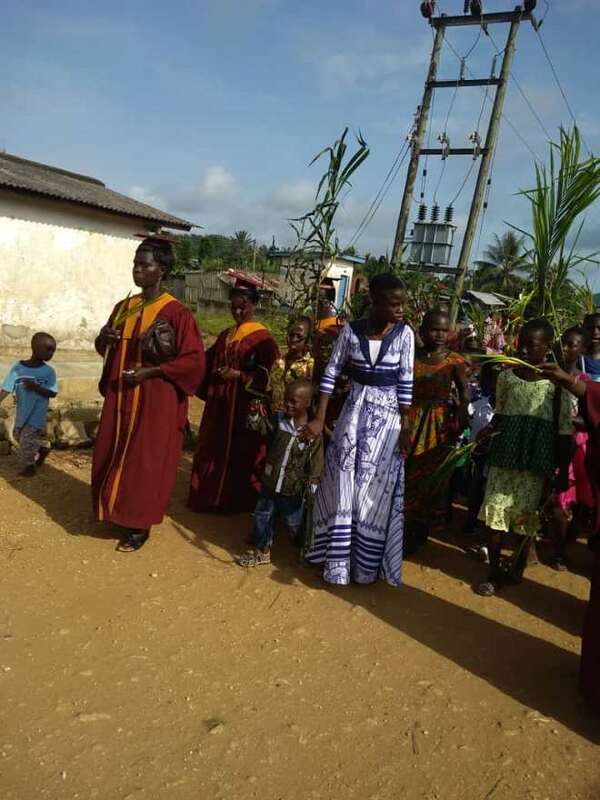 The chanting of 'Hosanna' made the folks in the town to feel the presence of Jesus Christ and remembered his death and resurrection. The children among them became very happy. 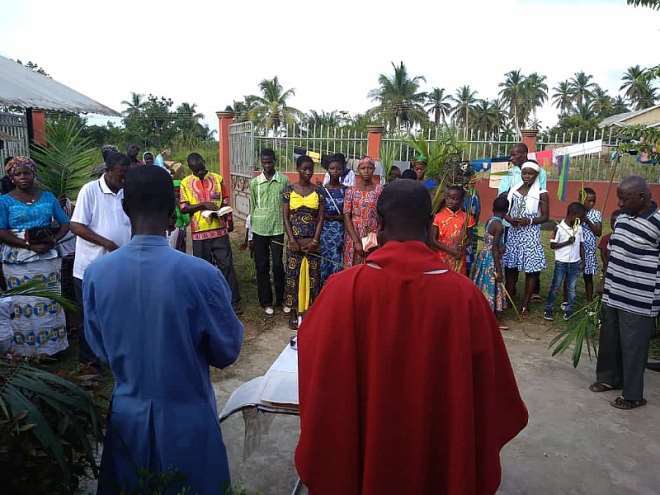 They, therefore prayed for the community, Jomoro Municipality and Ghana as a whole. Addressing the congregation, Rev. 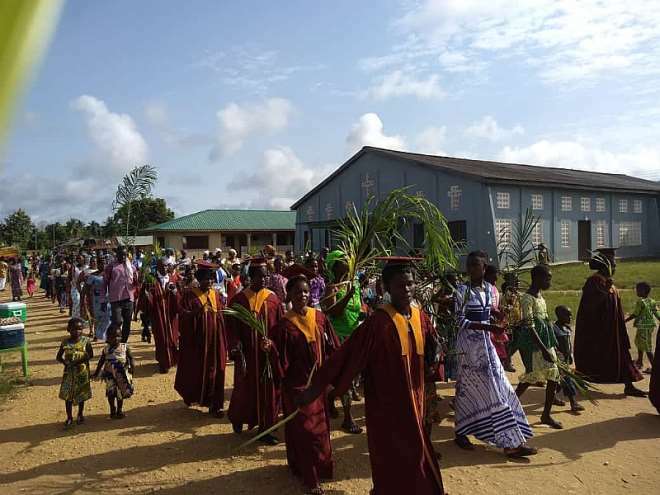 Father Samuel Bulu became exited and said "Today marks the beginning of the Holy Week. Thus, we are called upon to follow Jesus and live with him the last events of his earthly life". 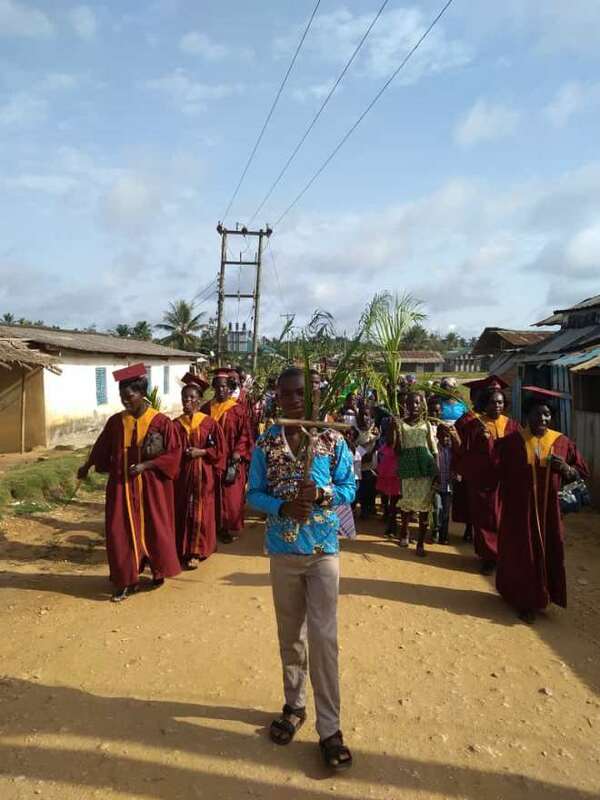 He added that "In today’s liturgy, we celebrate first the triumphant entrance of Jesus into Jerusalem amid the jubilation and chants of Hosanna of the crowd. Jesus enters the holy city, where he will suffer, die, be buried and resurrect for our redemption". He noted that "Then, the readings for the Mass narrate the Passion of Jesus: his sufferings, crucifixion and death as the humble Servant of God. From the Hosanna chants of the triumphant entry, we pass to the “crucify him” of the Passion". He observed that "But the attitude of Jesus remains the same: humble and silent. He bears the betrayal of Judas Iscariot, the abandon of his close friends, the hatred of the Pharisees, chief priests and scribes, the unjust condemnation of Pilate, the scourging and beatings of the soldiers, the curses and insults of the crowd, and the shameful death of the cross in obedience to the Father for our sake". He rethorically asked that "After listening to these readings, we cannot but ask ourselves some questions. How many times have we not betrayed those who trusted us? How often have we not turned back to humiliate the same people we had appreciated? How many times have we not been accomplices to the atrocities against some people and to the condemnation of the innocents? How many times have we not exchanged justice and integrity with the fear of losing our friends or our position? How often do we not sacrifice others on the altars of our pride, selfish desires and shameful ambitions?" 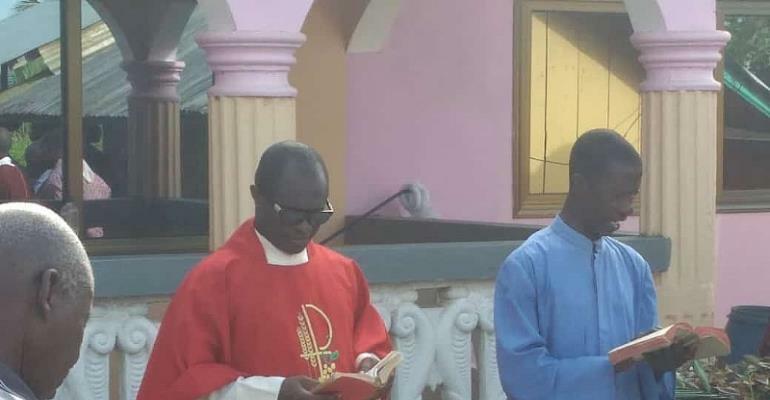 He concluded that "In any case, whether we are agents or victims of such acts, we must always remember that God will surely save the just and the innocent. He will not put them to shame. Amen". 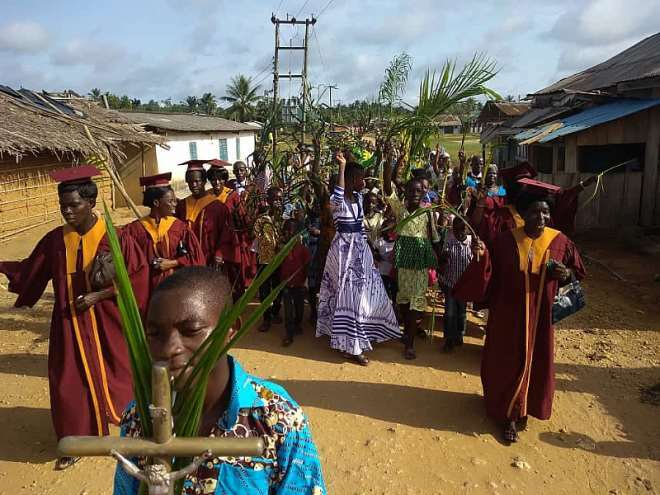 Christians all over the world celebrate Palm Sunday. 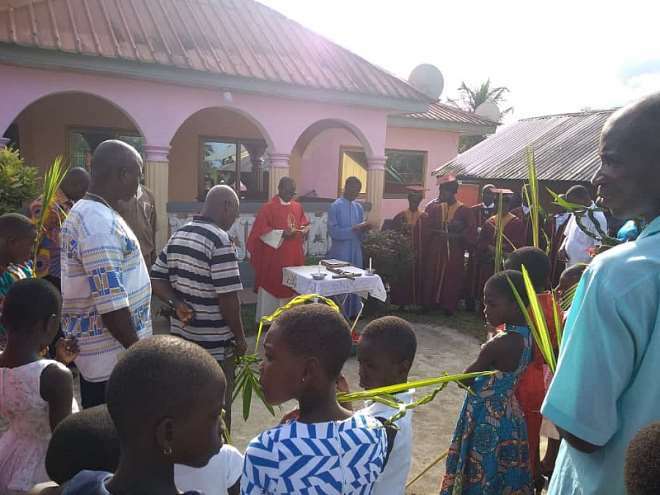 Palm Sunday is a Christian moveable feast celebrated in all major Christian churches, Roman Catholic, Protestant, and Orthodox.